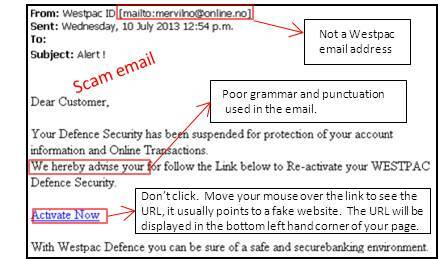 Lions should be aware of common e-mail and social media scams targeting club members. Sadly, some of our members have been targeted with these scams. The most common method is that a member will receive an e-mail, apparently from a member known to them, indicating that they are in trouble or have an urgent bill to pay. These e-mails appear to come from a valid e-mail address and mention the name of the Lion. Another common method is where a club receives an invoice to be paid for services such as insurance. In a busy club transacting substantial business, such invoices may be paid as a matter of routine. 1. E-mail addresses can be ‘forged’. Despite appearing to have been sent from one e-mail address, it can originate from another source. 2. Scammers will use social media, newspapers and other sources to create a believable story. They will identify a member who has posted online that they are travelling, and use that to fabricate a story. 3. Despite the fact that the Lions directory is only provided to members, e-mail addresses can be harvested by other means. 4. Links in scam e-mails direct the user to forged websites. These websites look the same as the authentic website but the “URLS” (web address and links) send the user to scam links. Although the natural inclination of our members is to assist their fellow Lions, please consider that a Lion who is genuinely in trouble would be more likely to seek local help, or use the telephone, rather than send an e-mail. Never send money to others without confirming their identity. Invoices received by the club should always be checked. The usual practice is that the person who has ordered the service, (eg: rented the marquee, purchased insurance, purchased supplies) should authorise the invoice. Note: If the e-mail has a link to a website to check the invoice; ignore it. The safest method is to type in the web address or telephone the provider. Finally, these scams are well-developed and appear authentic. I would encourage you to support members who have been affected through no fault of their own.